With millions of scooters sold all over the world, Razor is truly a brand to be reckon with in the world of these two-wheel tiny rides. It has been a favorite of kids, teens and stunt riders for years, but with the release of adult-size electric scooters, like E300 or EcoSmart Metro, it has become a powerhouse in the personal transportation industry. Razor E300 is a lightweight electric scooter without all those bells and whistles manufacturers put on their products trying to stand out from the competition. Simplicity is what makes this scooter the best seller. Who is this scooter for? The Razor E300 is the “adult” version of Razor E100 and Razor E200. Larger deck, strong frame and 10” pneumatic tires make this scooter looks like a real transportation device, rather than a toy. The brushed steel frame is good and feels sturdy without being too heavy. Design-wise this scooter is certainly not an eye-candy. With this price it’s unreasonable to expect the same attention to detail as other scooters, so it’s fine that wires for the brakes are loose and hang down the outside of the frame with cheap clips just about holding them in place. Simple, not stylish; functional, not fashionable; that’s what Razor is all about. If you need something pretty, take look at OjO. It features a high torque, chain driven, electric motor that can travel to 15 mph, controlled by the twist grip throttle. While this motor provides plenty of power for you to swiftly zip around on the flat, climbing hills is a struggle for this scooter. Considering that the E300 is designed for riders under 220 lbs, if you are an adult you probably weigh more, so don’t even think about going up an incline. The range on a full charge is between 7 and 8 miles, which is just enough for a quick trip to a grocery store, or a fun ride around the neighborhood. Razor E300 is not equipped with the abundance of features, but they did make sure to include ones that count. The large deck allows you to comfortably place both of your feet on it, and if you prefer to sit down while riding, there is a version of this scooter that comes with a removable seat – Razor E300S. Many cheap electric scooters (and some expensive ones) have small polyurethane wheels. While polyurethane tires are amazing because they are puncture proof and don’t need to get filled with air, they don’t provide that shock absorption as well as a good old fashion pneumatic tires. That is while riding Razor E300 will feel good and stable even on surfaces that are not ideally flat, such as dirt and gravel. It comes with a retractable kickstand that allows to quickly get off the scooter and leave it standing on its own, with no need to lean it to any surface or wall. The scooters battery system consists of two 12v sealed lead acid rechargeable batteries;and even though this is why of the reasons why the price of E300 is so low, investing in a good Lithium battery is a very good idea. These batteries will give you only about 40 minutes to an hour of riding time, and after that it takes 10-12 hours of charging for battery to be fully charged and ready to use again. 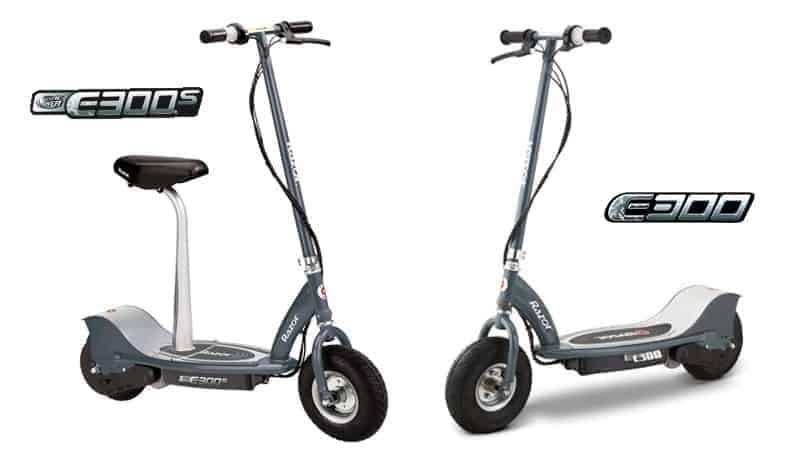 The E300 and E300S are the same electric scooter, only the E300S comes with a seat, allowing the rider to sit down and enjoy more comfortable ride. Basically, if you take the removable seat of the E300S, you get the E300. While some people claim that there are differences between E300 and E325, we can say with confidence that there are none. At least none of any significance. To put it in the words of the official Razor customer support: “They are the same scooter, with just different code names for different resellers”. Out-of-the box Razor E300 is the perfect electric scooter for teens. However, one of the reasons why Razor E300 is so popular is because it is cheap compared to most of electric scooters for adults, and it can be used as a great base for your custom build. Upgrade it with a stronger motor and better battery, and you will get a super-fast, hill climbing, awesome scooter for adults, for half of the price. Copyright 2019 RideTwoWheels | All Rights Reserved | RideTwoWheels.com is a participant in the Amazon Services LLC Associates Program, an affiliate advertising program designed to provide a means for sites to earn advertising fees by advertising and linking to Amazon.com.